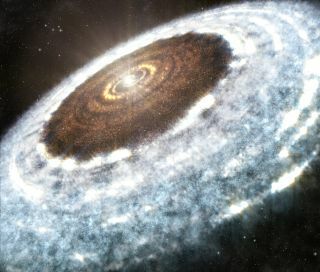 An artist's illustration shows the water snow line spotted around the young star V883 Orionis — the delineation between where the hot star vaporizes all water, leaving rocky dust and debris, and where ice and snow exist in the disk. For the first time, astronomers have caught a glimpse of the water snow line around a star — the point in the young star's orbiting disk of debris where snow and ice first appear. The star V883 Orionis, found 1,350 light-years from Earth in the constellation Orion, burns quite a bit hotter than usual — it is in the midst of a burst of brightness and heat from a sudden influx of new material. That let the star vaporize ice all the way out to 3.7 billion miles (6 billion km), or the average distance at which Pluto orbits the sun, catching researchers by surprise. The far-out boundary let them see the water snow line in radio wavelengths with the Atacama Large Millimeter/submillimeter Array (ALMA), a collection of radio telescopes in Chile that makes up the world's biggest ground-based observatory. ALMA's radio image of the star V883 Orionis and its disk of gas, dust and debris — a precursor of planet formation. The water snow line is visible as a ring around the disk — the first dark ring after the central brightness of the star — at about the average distance Pluto lies from the sun. In a News & Views column tied to the new work, which was published in the journal Nature today (July 13), Brenda Matthews, an astronomer at the National Research Council of Canada who was not involved in the study, wrote that the water snow line is important in determining which planets form — rocky planets form within it, and gaseous planets form out past it. When the star V883 Orionis suddenly heated up due to an influx of new material, the water snow line moved much farther out, meaning researchers could detect it with ALMA. Editor's Note: This article was updated to reflect the distance of the water snow line for most newborn stars, about 280 million miles (450 million kilometers).